Qualfon will open the doors to its new contact center and will highlight Harlingen as a U.S. location that provides access to high-quality skillsets and bilingual services at highly competitive prices. Harlingen’s low-cost-of-living combined with Qualfon’s industry leading employee tenure rates offer clients the ideal value in the USA for contact center and back-office outsourcing services. Qualfon, a people-driven business process outsourcing (BPO) company and global provider of contact center services, will hold a grand opening ceremony Thursday May 28th at its new contact center in Harlingen, Texas. 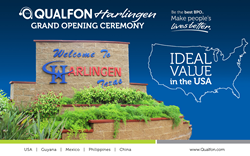 The event will officially open the doors to Qualfon’s new site and will highlight Harlingen as a U.S. location that provides access to high-quality skillsets and bilingual services at highly competitive prices. “Harlingen’s business climate and Qualfon’s new contact center in Harlingen serve as a demonstration of how Qualfon is continuing to deliver value-add outsourcing locations to its clients. Harlingen is a city rich with outstanding technical support, customer service, and sales talent that is 60% bilingual. In addition, Harlingen’s low-cost-of-living combined with Qualfon’s industry leading employee tenure rates offer clients the ideal value in the USA for contact center and back-office outsourcing services,” said Mike Marrow, CEO of Qualfon. As Qualfon unveils its new contact center at 2200 Haine Drive, the ceremony is expected to draw crowds. Harlingen’s Mayor, Chris Boswell, and Manager & CEO of the Harlingen Economic Development Council, Raudel Garza, will be key participants in the ceremony, which will include a ribbon-cutting celebration. As part of the event, attendees will also hear from Frost & Sullivan's Principal Analyst, Michael DeSalles, as well as Qualfon’s Founder and Chairman, Alfonso Gonzalez. Members of the media, Qualfon’s partners in the community, clients, and prospects are invited. After the ceremony, attendees will have the option to take a guided tour of the contact center site. Operations are already underway at the 42,169 square-foot contact center site, where 147 Qualfon employees currently provide customer support services in the identity theft protection industry. But the number of employees is expected to increase dramatically as Qualfon continues to invite new and existing clients to do business in Harlingen. “Qualfon Harlingen is expected to bring a total of approximately 1,000-1,200 new jobs to the region over the next few years,” said Marrow. Qualfon will offer a variety of job opportunities in the areas of customer care, tech support, sales, customer retention programs, as well as back-office services, and it is currently hiring customer service representatives, technical support representatives, and managers. For more information on available positions, contact Patti Galvan at 970-266-7029 or PGalvan(at)Qualfon(dot)com. “While new job creation alone is a cause for celebration, Qualfon and its people-oriented company mission have more to offer Harlingen than just paychecks,” explained Roberto Sanchez Mejorada, Qualfon’s Chief Mission Officer. Qualfon’s company mission is: “Be the Best BPO. Make People’s Lives Better.” That means Qualfon is putting programs and services into place with the aim to directly serve the needs of Harlingen employees, their families, and the local community. “Qualfon always starts with people. We care about our people—at work and beyond—and as we establish our presence in Harlingen, you will see our customized Mission programs build a network of support around what our employees and what the people of Harlingen want and need,” said Sanchez Mejorada. Building the business around the needs of people is a win-win that helps Qualfon create a competitive edge both in Harlingen and around the globe. With a business model that measures the company’s ability to make lives better, Qualfon is focused on people and achieves employee tenure rates that are two times higher than the industry average. Qualfon’s people-centered business plan is already in play in Harlingen, and management is confident employee tenure rates will signify strong results and only increase as the company’s Chief Mission Officer implements additional employee engagement programs that touch peoples’ personal purpose in life and instill a continuous sense of corporate mission, right down to the entry-level and frontline staff. Qualfon’s people approach to business is backed by Harlingen’s unique characteristics for BPO. Qualfon recognizes Harlingen’s populous as smart and scalable—fit for large-scale operations and its Fortune 100 clientele. With Harlingen’s population reaching upward of 335,000 within a 30-mile radius and with more than 30,000 are college students, the demographic is ripe for contact center work. Equally as persuasive is Harlingen’s low cost of living (81.3 index compared to the U.S. average of 100), which allows Qualfon to offer a competitive wage rate that attracts top talent and simultaneously offer outsourced services at lower cost when compared to other U.S. locations. People are another big attractant when it comes to Harlingen as a location for outsourced services. Qualfon and its clients find Harlingen a sound investment primarily because of its large concentration of bilinguals. Harlingen has a 61% bilingual population (compared to 31% in Texas and 20% in U.S.), and English/Spanish fluency is needed in the customer service realm as its clients—big consumer brands—seek to provide superior service to an increasingly diverse customer base. “Harlingen’s bilingual population can be seen a cost-effective alternative to the premiums companies must pay for bilingual employees in neighboring cities, states, and countries. Demand for outsourcing services in the United States is still high, and we believe Qualfon Harlingen offers clients an outstanding domestic option with highly skilled people delivering a great customer experience at a very competitive price,” said Kearney.